This is a quick post to show you what I've done for PAA's Monday challenge. The theme was "patchwork nails". I didn't have much time to do it but that's what I came with. This is 2 coats of Nubar Honeysuckle. You can see my review for this polish here. It's a bright pink cream. I kept this polish for 3 days and then added a small deco on it. I applied a thin coat of Nfu Oh 83, a glitter pink polish...but unfortunately we don't see anything here...I'll have to do a better combo to show this Nfu Oh's true value! Next step involved the tape technique. 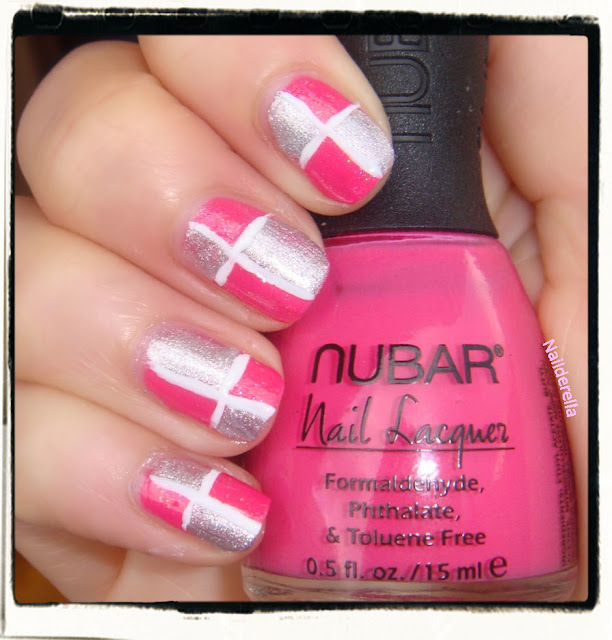 I cut 2 pieces of tape for each nail and covered the pink place in the above picture with these pieces of tape. Then I polished my nails with Essence - Style For Summer Nights, a silver polish with foil finish. And finally I added white lines with a small brush. Super mignon, les deux couleurs ensemble donnent un côté sucré tels les bonbons.